Ashtar Command Book Blog : Narts of the Round Table? Narts of the Round Table? “From Scythia to Camelot” is a controversial book, arguing that the legends of King Arthur and the Round Table are “Scythian” in origin. The term “Scythian” is a catch-all term for a number of Indo-European peoples living on the vast steppes north of the Black and Caspian Seas in ancient times (today Russia and the Ukraine). They spoke languages related to Persian, and are described as “tall and blonde with fiery eyes” in ancient sources. During Roman times, a sub-group of Scythians known as Sarmatians acquired special prominence, having penetrated into Pannonia (today Hungary) in Central Europe. The Sarmatians in their turn are divided into several groups, of which the Alans were the most prominent. Unknown to many (I certainly had no idea before reading this book), the Alans played an important role in Late Roman and post-Roman European history, with Alan warriors settling in Italy, France and Spain. At various points, Alan groups were allied with Goths, Vandals and Franks, which may explain why they are unknown to the general reader – these Iranian-speaking Scythians have simply been subsumed under the more famous Germanic tribes. Today, a small people known as the Ossetians in the Caucasus are said to be the last remaining descendants of the Alans (and hence of the Sarmatians and Scythians). Being pro-Russian, the Ossetians have become one of Putin's pawns in the complex geopolitical power struggles in this region of the world, but that is another story, as they say! Ossetian folk tales were studied by the great Georges Dumézil, who believed they reflected an original stratum of Indo-European myth. The authors of this book, Littleton and Malcor, have also studied Ossetian tales, more specifically the so-called Nart sagas, in the belief that they represent the original inspiration for the legends of that quintessentially Briton hero, King Arthur. Another source of inspiration are real events in Roman history involving Scythian groups. It's certainly possible for Nart sagas to have diffused to the West, including Britain, due to the aforementioned migrations of peoples. (Of course, it's also possible for Arthurian romances and other Romano-Celtic myths to have diffused to Ossetia!) I don't think the authors have demonstrated any convincing parallels, however. At least to me, the similarities sound superficial. Often, the authors are forced to resort to speculation. I don't see how the pagan “sword worship” of the Scythians, including bloody human sacrifices, is in any way connected to Arthur's removal of the “sword in the stone”, for instance. 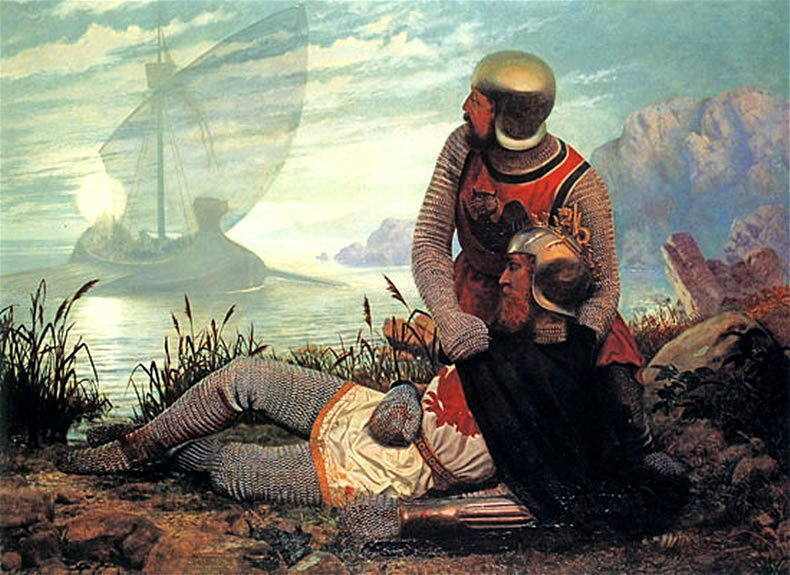 That being said, the idea that some Arthurian legends, most notably those connected with the Holy Grail, are from the Middle East or even specifically Persian, has a long standing in scholarship. The question could be interesting to pursue further. Note the connection between this and esoteric traditions about secret knowledge from the Middle East (Knights Templar, Assassins, Cathars, Christian Rosenkreuz, etc). Of course, “Persian” doesn't mean Ossetian. While this is all very interesting, the book nevertheless ultimately disappoints and never manages to conclusively prove its central theme. But then, I don't think Dumézil had much luck with his Ossetian material, either.